A special thank you to IncrediBundles for sponsoring this post. As always all thoughts and opinions are 100% my own. Have you finished your shopping? Yes or no? 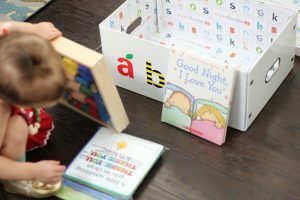 I guess it doesn’t matter because there is going to be a birthday or baby shower in your future and IncrediBundles has some amazing products on their site that you can have shipped in an adorable re-useable box for this holiday season or a special occasion. Of course Izzy wanted to show you our special order. Book bundles, bath bundles, sleep bundles, daddy bundles, a years worth of diapers… the list goes on! You can even create you own custom bundle & that’s exactly what I did! Little does she know that Melissa and dough play dough set is going under the tree. She wanted to open it and I told her it was sleeping. lol The things us moms say… right? Beyond the play dough kit we also got a new book to read at bedtime and a special book for the bath that talks about washing yourself in the tub. 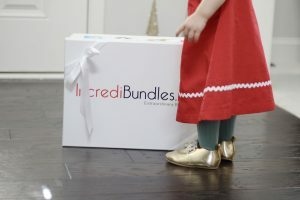 There are so many amazing products at IncrediBundles so I suggest you check it out and create your bundle… for your family or someone else. She is seriously sooooo cute! Incredibundles is awesome! Great bundle! I love Melissa and Doug toys! The books look awesome! this service is genius! perfect idea for grandparents! Love this bundle!! Izzy is the best little Vanna White showing it off! Melissa & Doug is a fav. I need to check them out! I keep hearing about them and think Christian would love it! He would have a blast opening it up! Oh boy, my grandma senses are tingling….this is fantastic. Thank you Regina! Isn’t it so great? Be sure to enter the giveaway! Um, I haven’t finished. I’ve barely started and I need this box!! It’s genius!! And I love Izzy’s dress!!! Thank you! I haven’t finished everyone either ? I keep hearing such great things about this company….now I really want to order a bundle of my own! 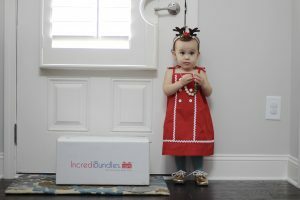 I’ve heard so many great things about IncrediBundles! Izzy’s box looks like so much fun, my kids would love it! And seriously though, how cute is she? I can’t believe how big she is! That looks like such an incredibly thoughtful gift for growing minds! Love it!